Astell & Kern players get NAS streaming and Qobuz downloads | What Hi-Fi? A firmware update to the AK240 allows users to stream music - from MP3 to 24/192 - from a NAS device directly to the player, while all three current A&K players can now download music directly from Qobuz. The free update to allow music streaming from a network-attached storage device (NAS) is available now for the Astell & Kern AK240, and is said to be on the way for the more affordable AK100 II and AK120 II music players. The high-end A&K players of course major on high-res music playback and these files are also supported when streaming from your NAS. Also new is direct downloading from the Qobuz music download store. 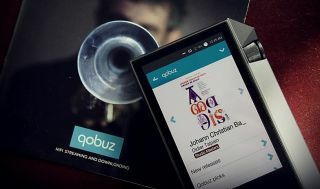 The A&K by Qobuz app was trailed back in May and is now available on all three current Astell & Kern portable music players with Wi-Fi access. The Qobuz download store launched last month, following on from the launch of the CD-quality streaming service, and offers a solid selection of CD-quality or better albums to download. The albums are available in a variety of formats from ALAC to FLAC to WAV.